Recollection is a project to review my record collection. I will listen to an album I own and review it. The album will be chosen randomly. Pictured to the left is the album’s vinyl release. When I interviewed Plaskett I had him sign my copy; it sits framed in my living room. Plaskett had, throughout his years with Thrush Hermit, traveled from coast to coast. Down At The Khyber is a record about a life on the road. From the title track where his true love will never betray him, even if he’s on the road, to singing about his popularity soaring while on the road to Saskatchewan, to driving across the country by the “Light of the Moon.” Plaskett’s songs live in the geography of Canada; he practically bleeds maple syrup. 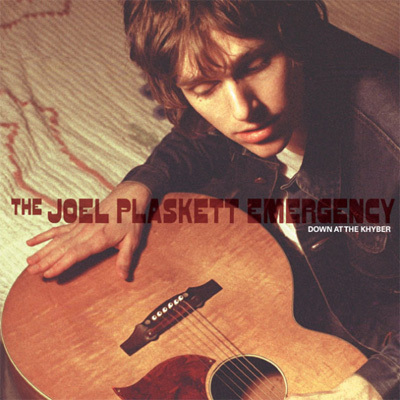 The Joel Plaskett Emergency were Joel Plaskett, Tim Brennan, and Dave Marsh. The title track is about meeting his love at Halifax’s storied Khyber Club. It’s a tale of love and trust. It’s also a killer rock and roll song. “Blinding Light” is a beautiful country duet with the then-Guthrie Ruth Minnikin. Any time Minnikin sings is a pleasure and Plaskett puts in his best vocal performance of the album. Plaskett apparently likes to drift off to the CBC and found that the 3AM sign off was too early. “True Patriot Love” is a rock and roll anthem about the CBC’s sign off. The album finishes with “Light of the Moon,” a beautiful acoustic song about traveling from Canada’s west to the east. It’s hauntingly beautiful and ends the record with a ruckus deserving of this album. This album is pretty damn solid, but I often take a pass at “This Is A Message” and “Unconditional Love.” Not Plaskett’s best songs, but still good.